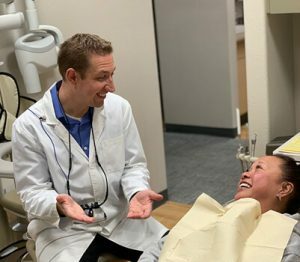 At Carmel Mountain Dentistry, our entire team takes pride in helping patients feel like they’re the star of the show whenever they come in for care, providing warm, personalized attention that meets your needs and exceeds your expectations. Dr. Bunker is a highly experienced and dedicated dentist who believes that his patients deserve the best that dentistry has to offer, and there’s nothing more important to him than building strong, trusting relationships that last with everyone who walks through the front door. Carmel Mountain Dentistry is proud to serve San Diego, CA and surrounding areas. We are dedicated to providing the highest level of dental medicine along with friendly, compassionate service. If you have any questions about how we can care for your teeth & mouth, please don’t hesitate to call us at (858) 675-9055. Thank you! Ready for a different dental experience?